I can't say that I remember when northern VA has had such a string of severe isolated thunderstorms. We were able to visit 3 suspension bridges (again in the Woodstock VA area), before we found ourselves trying to outrun wind, rain, and lightning. The speedy storm caught up with us requiring us to don our rain gear. Riding up the west side of the Blue Ridge was wet. Riding down the east side was dry. Thank you Blue Ridge Mountains. This bridge is beside the rundown Lantz Mill. The surroundings make this one of the prettiest bridges we've seen so far. Alas, I didn't take photos of the adjacent Mill. Crossing what we learned was Little Dry River was this, clearly hardly used bridge. Somewhere up the road is Big Dry River. Located in a beautiful park, this bridge doesn't have the charm of the other bridges...it's not squirreled away in the woods! Limited time had us planning a day trip to the Woodstock, VA area. Our plan was to see four suspension bridges in the area and the route would have us riding roads we hadn't before--a double plus. Unfortunately, the best made plans are not always successful. Of the four bridges, we were only able to locate two. One bridge, the Seven Fountains bridge, was nowhere to be seen. I'll need to do more research to find if this bridge still exists. We didn't locate another bridge, one of the two I designated as "Woodstock", because we couldn't find an access road down to the river. This one warrants another trip to see if access is available from another direction. Our trip was cut short by bad weather: isolated thunder storms. In a few short minutes, the sky went dark, lightning flashed, the wind kicked up. It happened suddenly enough to freak out the weak hearted...we were undeterred. Being close to I-81, we broke our "no Interstate" rule and headed north just ahead of the rain. We gained enough on the rain that when we turned east onto I-66, we were able to avoid it all together. We made it home in record time (the only benefit of breaking the no Interstate rule) without donning our rain gear. All in all, a fun ride. No joy. We couldn't find the bridge. Again no joy. Gravel roads didn't appear to offer access down to the river. So far, two-for-two no-shows. Not a good start. Finally! On one side, we found the remains of a bus that appeared circa 1950s or earlier. Unable to imagine how the bus got there, we imagined a horrific accident where the bus careened off the mountain side road to its final resting place with the driver, long since a picked clean skeleton, still behind the wheel. Our skill at filling in the missing details of the mystery obviated any need to look into the bus--who are we to disturb a resting skeleton? On the other side of the bridge was a deer who seemed only slightly bothered by our presence. Alas, no deer photo. This bridge was noteworthy because of how high it was off the water. Funny was a sign that urged caution if water was at the level of the bridge. 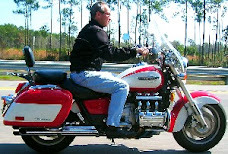 Check out these tips, techniques, safety information, and other good stuff from the Motorcycle Safety Foundation Library. I identified a suspension bridge in Buchanan VA (if you click this link, then click "Places") that was just about the right distance away from home for the inaugural Summer of 2008 Suspension Bridge Photography Project. This bridge would be our primary goal and I picked a route that had us passing 4 other bridges combined with a 50-mile stint along the Blue Ridge Parkway, We made plans to stay the night in Waynesboro and headed out just after lunch the day before Memorial Day. We returned before dark on Memorial day having ridden a half mile less than 500-miles. Here's a map showing the location of the bridges and the route taken. These data were entered into the Garmin Zumo GPS I use. After the requisite ride up & down the Blue Ridge on Rte 211, we headed south east on Rte 522 and almost immediately south west on Rte 231 to Rte 642. We rode into the small town of Criglersville from the north. A idyllic spot in the road with white buildings on expansive farm lands. Turning west on Rte 670 and traveling less than a mile brought us to the first suspension bridge that crossed a small stream that parallels 670. On one side of the bridge is 670 just east of a small church and on the other side is a house. Criglersville boasts two suspension bridges. Back at the intersection of 642 and 670, another, smaller suspension bridge crosses the same river. Here, a concrete pad is just below the water's surface and cars pass through the water to get from one side to the other. The suspension bridge allows pedestrians to do the same without getting wet. From Criglersville we continued on secondary roads to Waynesboro where we spent the night. Making a rather late start of it on Memorial Day, we headed for Buchanan. I mistakenly thought the Buchanan suspension bridge allowed vehicular traffic. It, like all of the others we saw on this trip, are pedestrian bridges only. The Buchanan suspension bridge is large. Spanning the upper end of the James River, it is attached to the Rte 11 roadway bridge on one side and crosses to a residential area on the other. After eating, we started in the direction of home intending to see the suspension bridge in Tyro. Because all of VA's suspension bridge locations are stored in the GPS, it was easy to see we would pass right by another bridge near Marlbrook, VA. Less than 10 miles north of Lexington on Rte 11, we turned southeast Mackeys Lane, a little jag through the town of Donaldsburg continuing southeast on Midvale Highway to the town of Midvale. Traveling north on South River Road and about half way between the towns of Midvale and Marlbrook is a suspension bridge with South River Road on one side and nothing on the other. A bridge to nowhere--perfect! Continuing north to Vesuvius where we turned southeast on Rte 690, we headed for the last suspension bridge we planned to see on this trip. Crossing over the Blue Ridge Parkway (where we had been the day before) to about half way between the towns of Nash and Tyro is another small bridge. This bridge is not visible from the roadway and had it not been for the GPS coordinates provided by the Bridgemeister, this one would have gone unnoticed. We parked and made a little hike before finding the bridge. Well concealed now, it may be visible--assuming you know when to turn your head and look--during the winter months when the trees are bare. This small bridge was our favorite because of its seclusion.